While talking with one of my web design clients, the question of where to put certain design elements came up. I made this numbered image so that we could talk about regions of the Google heatmap image while working on his new site. The cool feature of this heat map is that it is based on the big G's extensive Adsense data to recommend placement of ads for the most clicks (darker is higher click density). Are you keeping these sorts of test results in mind as a starting point for your own tests on new sites? Update (May 10, 2011): through "random" connections this evening I just ran across Michael Campbell's Ultimate Heatmap report which overlays the major advertisers' heat- and clickmaps to produce his "ultimate" map. 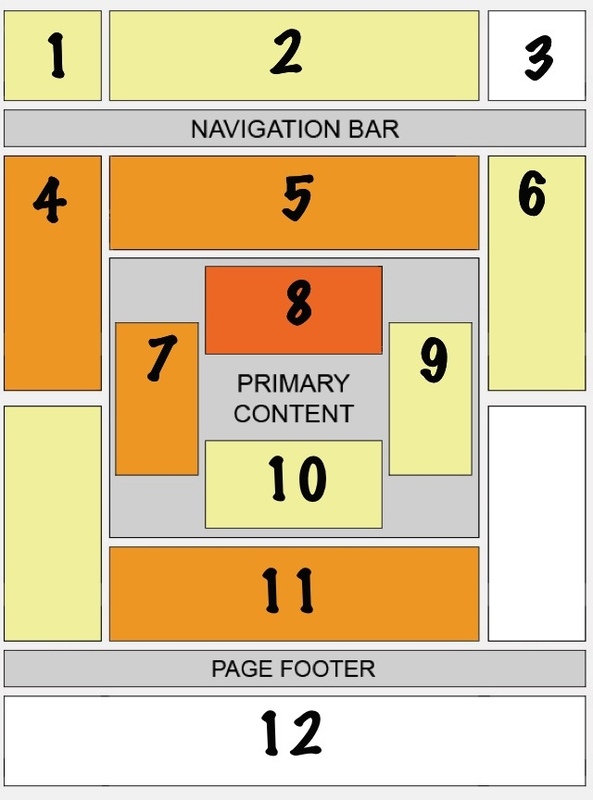 The report also includes the main ad sizes to consider and 9 heavily tested templates for advertising on blogs. He makes the same suggestion of using his results as a starting point to run your own tests. I recently dove into a project to set up Facebook Tab Manager, a cool plugin from David Carr that feeds a Facebook fan page it's content from your WordPress install. There are a couple cool features of the plugin for turning off certain WP filters that makes it especially nice. Otherwise, you can create your fan page content just like you create your blog content -- same interface, editor, and plugins. The challenge I set up for myself was to get the much touted "forced like" feature integrated for my friends and clients. I let a few people know that I was looking for testers and my friend @ShelHorowitz sent a DM on twitter mentioning that he boycotts any pages that use "forced like." This got me thinking. So here was my question: is having more content available to those who "like" your fan page on Facebook any different than sending exclusive content to those who subscribed via an email capture page on a web site? For those that don't know, the idea of a "forced like" is that in order to see the content on a Facebook fan page you would have to click the "like" button and become their "fan" first. I've seen people selling poorly thought out schemes for collecting a bazillion fans overnight that rely on the curiosity factor around this hidden content as the only reason to become a fan. I suspected that the reason Shel found that objectionable is that the reason it is named forced like -- it is typically done with such hype and strong language that it is assumed you won't be able to see anything unless you are a fan. In the extreme cases, where the only content on the fan page is the single piece of "hidden" content, it is probably true that you'd have to "like" it before seeing anything. The funny thing is, if that's all there is to see, it's probably not worth the time/energy/attention to like it. There are many legitimate uses for splitting publicly viewable content from fan/like/subscriber-only content. Rewarding those who "join the tribe" is a great thing, you just need to make sure you're giving other reasons to join besides just the "bribe." You shouldn't need the landing tab to include things like contact info because that is always visible on the "Info" tab, and with congruent activity the wall posts should give people a good idea of what to expect in their news feeds as fans. Depending on the level of tech-savvy of your audience, you may need that landing tab to include explicit instructions for a visitor to browse your other tabs and/or click "Like" to receive future updates and describing how they'll get those updates. It turns out that not being able to see much content was only a minor part of Shel's objection, which he elaborated to me later in the day. The main issue around liking pages, forced or not, is that of implied endorsement in a public arena and the reputation management that goes along with that Like/endorsement being spread across your friends' news feeds. Now you need people to know and trust you enough to "Like" you! With all that in mind, if you'd like to be notified when I have my updated version of that plugin ready for a wider audience, go ahead and enter your name and email in the form below and opt-in. I've been spending the day playing with my darling children and during lulls in the LOLs I've been pondering certain little children and their families who will be just as joyful for their own "heart day" funded on this "heart day." My friend Dr.Mani is continually raising awareness for congenital heart defects and he always leverages the obvious holiday: St. Valentine's Day / CHD Awareness Day. This year Dr.Mani has two things happening on the auspicious day -- one for business owners and one for those who want to use their passion to make big things happen. The larger bundle has all of that plus two additional products that are, in my opinion, the main reasons to take advantage of this special. Ezine ANTI Marketing and 5x Profits SYSTEM, like TWR, contain much of Dr.Mani's hard-won wisdom for selling products online. I love his contrarian advice in the Ezine ANTI Marketing product -- you don't need a huge list if you build relationships with your small list! The other special today is for those with passion that has not necessarily translated into action as well as you would like, or who would just like to help fund a child's heart surgery with a few dollars. Dr.Mani has decided to launch his book "47 Hearts" on the Kindle ebook platform and has several additional reports as gifts for picking up your copy today. I have had a copy of 47 Hearts for quite a while and I obviously needed to re-read it since I was blown away again by the great advice on each page. I really believe that anyone with even a little passion for something bigger than themselves can benefit from this book -- and periodically revisiting it. Oh, and even though this is published on Kindle, there are a number of options even without a Kindle device. Amazon has apps for iPhone, Blackberry, Android, desktop, etc. Also, Dr.Mani will cheerfully send you a PDF version of the book after you send him a copy of your receipt. Rather appropriately, the solution I came up with is also through Amazon. You may not be aware of Amazon's Mechanical Turk program. Mechanical Turk is a platform for businesses to request tasks, "HITs" in their terms. These tasks are small things that a computer can't do easily, but a person can. So, MT allows the business owner to treat the turk as if it were a computer, but people perform the tasks. Why Mechanical Turk is relevant is this, they pay people to perform these HITs. Depending on the task and the business each HIT can pay $0.01 and up. Checking just now, I saw HITs up to $7 each. Now, the $7 HIT involved up to 3 hours, a phone, and some French language skills, so not everyone could easily perform that one. I did, however, see several that paid around $2 for "testing a website" that were 10-20 minutes max. Oh, and as a bonus, they deposit the payments directly into your Amazon.com account, so then you can buy 47 Hearts without any shuffling of funds. So, there are your choices for how to help some little hearts today. 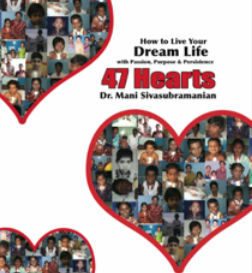 Dr.Mani's Business Booster Pack and/or 47 Hearts - How To Live Your Dreams With Passion, Purpose & Persistence! This year I'm fending off my own S.O.S. (shiny object syndrome) and concentrating on one business area at a time. While feeling the psiren's call of the shiny product/course/software, I had a moment of clarity and committed to following through with the materials I've already got from people I resonate most with. Here's the short list of my top 10 folks, in no particular order. Of course, after making the list a bunch of other influential names came to mind including Willie Crawford, Mark Austin, Dave Lakhani, Lee Collins, Tellman Knudson, Paul Evans, Nicola Cairncross, Lynn Terry, Terry Dean, Stephen Dean, Ryan Healy, Stever Robbins, Jonathan Altfeld, T.Falcon Napier, Mike Jay, and many other friends and mentors. The more "perfect" version of the list was quickly becoming a full blown report as I gave a little background on each person and further resources on what I find most influential from each of them. I'll certainly release that stuff as I get it produced. In the meantime, there's my list (and if you can't figure out my story-arc for the year, sorry, it's all there between the two lists!). The interesting thing to note is that I have interacted directly with almost all of these folks in one way or another -- most on the phone or gasp in real life! A couple of them are on my lists in spite of the fact that I don't really like interacting with them -- their info and example is so good that I set aside my random emotional reaction and study what makes me come back in spite of that emotional reaction. Yeah, they are that good at what they do. Special thanks go out to Dr.Mani for the example of his Top 10 IM Ezines post and Nicola Cairncross for her article about her Top 10 Business Influences so far. Now that we've made it through the gift buying holidays, I invite you to take a moment and reflect on your year. No, we will not be making any resolutions, but we may be saving some lives. This year, more than ever, I am thankful for a strong, healthy heart -- something I often take for granted. 2010 has definitely been a year of heart awareness for me: my father-in-law having a heart attack a couple months ago, my friend Jon Benson collapsing due to some genetic heart issues, and my friend Dr.Mani saving more kids born with congenital heart defects. My father-in-law seems to be doing well and Jon is back to gallivanting around the globe while teaching more people how to "beat their genes" like he has -- through solid diet and exercise. Now, Dr.Mani always has room to improve. Even though he has had a record year performing surgeries for his "heart kids" he has so many other kids that could be helped if the funds were there to subsidize the medical expenses. Here's where you get to help. Think back on all those things you are thankful for this year and dig deep to "donate" to these kids. Dr.Mani is one of my top 10 people to follow in my information marketing business and the fact that he knows his passion in business -- to support these kids -- is only one reason I follow him. The other main reason he's in my top 10 is that he knows how to make online business work as a busy person without a team of employees, VAs, or outsourcers -- just his own efforts in between the many tasks of a professional surgeon. If having a "solo-preneur" business is one of your goals, now is the time to act. Dr.Mani has offered the chance to help the kids while helping yourself. He has put together a bundle of some of his best products for you while all of the profits go straight to fund more heart surgeries. Oh, and he's set a goal of raising $10,000 by the new year, so he's only offering this particular bundle until then. No new year's resolutions here, just positive changes -- in your business, in the hearts of these children, and hopefully your own heart too. Thank you Cory, for allowing me to share on your show today. I hope that the audio I put together can help your listeners as much as it has helped my readers. Click here for the free audio. Last night I ate at Five Guys Burgers and Fries for the first time. The guy behind the counter watched us eyeball the menu for an inordinate amount of time and asked if we'd been there before. Shaking our heads he explains "the regular is two patties, the 'little' is one -- otherwise they're pretty much the same." This is an interesting reframe for encouraging over consumption (along with the name of the restaurant encouraging me to add on an order of "regular" fries that filled half the bag!). The concept that only one burger patty was for eating "light" or for a "little" kid is the first part of the reframe. The second part, that I fell for hook-line-and-sinker, was the (slightly macho) "well, if it's regular to get the double then I don't want to be a 'light weight' " along with the "oh, and for just 10% more I get twice as much burger!" Now, here's your challenge: reframe your product/service offering so that the choice that will serve your clients best is the "regular" -- the obvious choice -- and that any alternatives you give them are not as emotionally appealing. And make sure it's win-win and ecological for everyone involved! As we are full in the swing of the holi-daze, it's good to remember what the season is all about. It isn't shopping, spending, buying -- it *is* about giving and love. I was coming here to share about a particular book that an associate asked me to promote. I changed my mind after seeing the "trippy" gifts being submitted for that launch. Instead, I'm going to recommend the book Allowing by Holly Riley. I have heard nothing but good things about Holly and her book from our mutual friend Don McKinnon (make sure you grab a copy of his gift among those available by registering your book purchase at http://hollyriley.com/allowing/). So, rather than pimping a book I didn't believe in but had been asked to share, I shared a book I could believe in because a friend I respect loves the book and enjoys the author as a person. Relationships trump pretty much everything else. As you head over to Amazon and pick up Holly's book, ponder how your business can build on and build up those relationships that matter and where you may need to eliminate or minimize other relationships that don't fit with your mission (which is hopefully more than just strip mining cash and disappearing -- which it must be, or else you wouldn't still be here reading my stuff!). In the meantime, remember ''the greatest of these is Love''! Doing business on the Internet is "easy" -- you just put up a web site and collect the moola, right? Or at least not any more than doing business offline is as simple as setting up an office and getting paid. So, what's missing from this overly simplistic idea of business? People for one. Interacting with those people for another. An exchange of value for a third. And online there is the small issue of wrestling with technology. I think a better model of business than thinking in terms of location (web site/office) is to think in terms of the actions required for business to occur. I've got it down to 3 actions. Business is about being able to EAT. Your business needs to expose the right people to its message, that message needs to generate some action from those prospects, and they become leads or actual clients when they trade value with you. This same model works for online or offline, first time buyers or repeat customers, and across industries. How does each of the pieces of this EAT model play out in an online business? Getting your message in front of the right people is the first step. Don't mistake "message" to just mean the words you use. Non-verbals often count for more than the "verbal" content of the words. I'm not discounting the power of well structured verbal patterns using the "right" words, just accentuating the often neglected non-verbal component. Your content and the non-verbal "framing" of its appearance is one of the biggest ways to expose people to your message online. Whether through your website, your facebook profile/fan page/group, your twitter page, your squeeze pages, or your sales pages you want to expose people to the message in such a way that it generates the desired action -- not that just looks cool or pretty! There are many courses out there teaching "traffic generation" but few address the idea of exposure driving action. Not to mention the fact that every exposure to your message should be congruent and consistent. "What am I supposed to be congruent and consistent with, their frame of mind or my message?" However you get people there, you'll have done some promoting, connecting, and "pre" exposing (even though it's all exposure -- good, bad, or ugly). Hopefully that exposure is driving our next component -- action! There are countless actions your web site can generate. Some of those actions, when taken by your visitors, get you closer to your goals. Others take you further from those goals. Knowing the difference leads to focusing on new actions (or new goals). There are many more actions when people hit your web site than "buy" or "leave". One exercise I use to get clients clear on this step is to list 50 to 100 actions people could take when exposed to their message (primarily on their web site, but also extending to all other exposure channels they are planning to use). If they don't automatically get the bonus points by doing it themselves, I'll often help walk them through the sorting of resulting list by type of visitor or traffic source. What's that you're thinking so loudly: "Why list 50-100 actions? I just want them to buy my product or service!" Every time I run this exercise we come up with smaller actions than the huge the initial exposure direct to sale jump that many people expect from their site. It can be as simple as "continue reading", or "click on a link to learn more", or "call for a consult" -- but going for the sale straight away is the equivalent of asking for a pre-nup on the first date. "Courting" your prospects with smaller commitments and smaller actions that lead to your larger actions is part of the dance. Whatever the scale of the commitment, you need exposure to your message to generate some action on the part of the hearer. That leads into our final step -- trading. Like the action step, trading is more than just collecting money and delivering a product or service -- it is about trading value in whatever form. You may want to start by trading some of your valuable content for their valuable time. Or trading a report for an email address/facebook like/retweet/blog post. Again, it is valuable to brainstorm what sources of value you have to offer and what value your perfect client would have to offer. When you have that info and your sales stats like the value of an email subscriber and lifetime value of clients, then you can decide how much you are willing to give in return for what it is you want. Keep in mind, that a "fair" or "even" trade is not a "good" trade in the long run. If the client doesn't feel like they've gotten back 10 to 100 times their "money", then you are almost certainly hurting future sales and therefore lifetime value of a client. The easiest sale is the repeat sale, and the easiest repeat sale is to a customer that knows/likes/trusts you, and the easiest way to know/like/trust you is by having such a spectacular return on investment that spending more time/money/resources with you is a no brainer. So, what happens after you've exposed a new prospect to your message, generated an action on their part, and traded value with them -- are we done? Hopefully, as part of that trade, you got contact info so that you can follow up with your new lead/fan/follower/client. Oh, look -- follow up is another exposure and another chance to generate an action leading to a trade. Now, this post was an exposure in and of itself. The actions that you must have taken to get here include clicking a link and continuing to read. And I've traded a model that can generate significant ROI in return for your attention. Let me expose another opportunity for you to take action and get a 10-100x return on your next trade with me. While many non-retail businesses slow down this time of year, I'm among those who are ramping up and gaining momentum to drive next year into being a spectacular year. If that sounds good to you too, keep reading -- you're in for a treat! Initially, I was going to offer you my services as contractor -- things like building custom WordPress themes, setting up web sites and facebook fan pages, or establishing affiliate programs for a few lucky clients. But I didn't want to limit people to just the likely tech tasks. Then I realized that before I did any of those sort of jobs I'd have an initial consult (to establish how best to serve you in exposing your message, generating actions, and facilitating trades). Rather than offering the technical work directly, I'm offering the consult. The more I thought about it the more excited I became -- I'm continually amazed at the breakthroughs and clarity that I get in short consults with my existing clients! And that meant I will be able to assist you in unlimited ways -- more than just the technical tasks I could generate off the top of my head. My current price for a single 20 minute "Lightning Coaching" session is $75. I'm not just giving away my time (I have plenty of my own projects to work on), but I know that it'll feel like it was a "no brainer" once you've had your session and start receiving the returns on your time invested. NLP is some powerfully quick "medicine" for mindset and marketing ailments, and 20 minutes is plenty of time to talk through and plan solutions for nearly any technical issue you may have. In either case, if you need further work done outside the 30 minutes, I'll credit your initial investment in the quote. Whatever your technical/mindset needs, I'm here to help. Just a quick note to let you know that CookieMonster-plus has been updated to allow use on all pages (even ones using a template that doesn't include a call to get_header!) and I found and squashed the pesky foreach() bug I couldn't seem to replicate until today. Grab the CookieMonster-plus plugin directly or check out the main CookieMonster-plus post for more details. BTW, the reason I found these bugs is because I was putting up a new freebie for a giveaway event. I'm also working on a report that explains more of what CM+ can do. If you've got questions, comments, or suggestions to share let me know!